7th: Close to Home – Make a food from your own country, state, or hometown. Hello, and happy birthday to me! I am currently in Melbourne stuffing my face full of exciting food, which will have to wait until after VeganMoFo finishes to share it with you, but the food here is gooooood. So much to share! But back to VeganMoFo. We are moving into International Week, but starting out with sharing some of our close to home favourites. In the past I have made Sausage Rolls, Lamingtons , and Fairy Bread, as well as the regular burgers, sausage sizzles, meat pies and so on. Plus a lot of Vegemite. And let's not forget the wonderful produce - bananas, mangoes, macadamias... it is coming into mango season right now and I can't wait! Today I am taking a slight cheat, in that I didn't make the things in this post. I bought them from Brisbane's own vegan dessert bakery, Veganyumm. Because if there is one thing better than making and eating a local favourite food, it is buying a local favourite food from a local business that is doing wonderful things! I went there to buy these specifically for VeganMoFo as well, so there was some VeganMoFo effort involved. First up, the Vegemite and Cheese scroll! 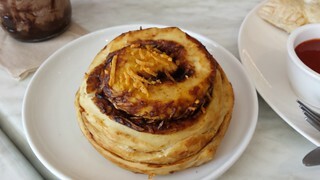 Like a savoury cinnamon bun, with Vegemite and melty cheese on the inside instead of cinnamon sugar. I love Vegemite and Cheese together! 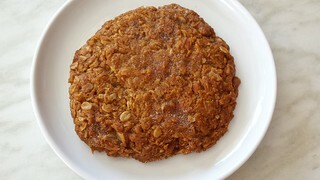 I also got an ANZAC biscuit. I love ANZAC biscuits, and this is one of the best I've had. It is my second favourite thing to get from Veganyumm (after their Peanut Butter Chocolate Chip Bar). This biscuit is HUGE, and it just so delicious. I am looking forward to seeing what local delights everyone else is sharing today! If there are any Australians reading this post, what are your favourite local foods? Much to Dim Sim's disgust, she was not an only cat for long. 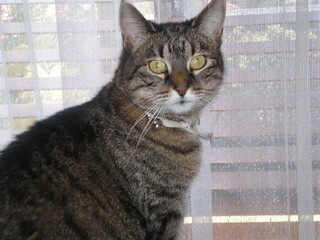 Gizmo was four years old when I rescued her from being put down at a local vet clinic. I am so glad I did, because the time I was lucky enough to spend with her was amazing. She was amazing. Gizmo passed away four and a half years ago, and that loss still breaks my heart. I love savoury buns! My favourite thing at Cinnaholic in Berkeley was the pizza roll so I think I'd enjoy the vegemite & cheese combo. Savoury scrolls are pretty awesome. Vegemite and cheese is my favourite, but pizza would be pretty great as well! Woah, the vegemite and cheese scroll looks amazing! Pretty Gizmo! Hmm... I don't know what my favourite Australian food is! The one I eat most often is definitely Vegemite (on toast). I also love Anzac biscuits, and for a good old Aussie BBQ I like marinated field mushrooms - my current favourite marinade is the one in Vegan Secret Supper. Vegemite is a staple in my household. Cannot be without it! I still have yet to try vegemite... one of these days! I will put some in a package swap someday! Though at one point Vegemite was banned in the US. Which is ridiculous. Not sure if that is still the case. But I know someone else in the US who just had some shipped to her. Vegemite is legal in the US, you can buy a jar but it is usually a big price tag (like $8 for 200g) Not sure if that is particularly expensive or not. From what I remember about vegemite, a cheese scroll made with it would be awesome!